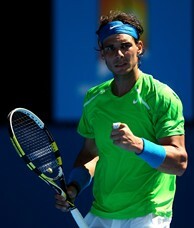 Rafael Nadal celebrates winning a point in his second-round match against Tommy Haas. 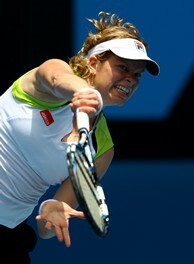 Kim Clijsters serves to Stephanie Foretz Gacon. MELBOURNE, Australia (AP) -- Rafael Nadal advanced to the third round of the Australian Open on Wednesday without much trouble from his opponent or his injured right knee. Rival Roger Federer got through without picking up a racket. Nadal beat German veteran Tommy Haas 6-4, 6-3, 6-4 in a 2 1/2-hour match, declaring that the twisted tendon in the heavily taped knee was not a concern. Just before Federer was due on Hisense Arena, the Swiss found out that his scheduled opponent, Germany's Andreas Beck, had a back injury and had to withdraw. "Now, I'll just take it easy this afternoon and come out tomorrow and hit intensely, and then I'll be ready for the next match,'' said Federer, a four-time Australian Open winner. Nadal, asked after his match if he would have appreciated the same kind of good fortune, was pragmatic. Nadal and Federer could meet in the semifinals next week. Top-seeded Novak Djokovic and fourth-seeded Andy Murray, the threats from the other side of the draw, play their second-rounders Thursday. Two of the women's title contenders, defending champion Kim Clijsters and No. 1 Caroline Wozniacki, both won their second-round matches Wednesday on their way to a potential quarterfinal meeting. French Open champion Li Na also advanced, defeating Olivia Rogowska of Australia 6-2, 6-2. She could meet Clijsters in the fourth round in a rematch of last year's final at Melbourne Park. Clijsters needed only 47 minutes to beat Stephanie Foretz Gacon of France 6-0, 6-1 and Wozniacki defeated Anna Tatishvili of Georgia 6-1, 7-6 (4). Clijsters said she doesn't give a lot of thought to who she'll face down the road of any tournament. Third-seeded Victoria Azarenka, one of five players who could have the No. 1 women's ranking by the end of the tournament, was scheduled to play Australian wild-card Casey Dellacqua in a late match Wednesday. Elsewhere on the women's side, 10th-seeded Francesca Schiavone was eliminated 6-4, 6-3 by fellow Italian Romina Oprandi and No. 16 Peng Shuai of China lost 6-2, 6-4 to Iveta Benesova of Czech Republic. No. 7 Tomas Berdych beat Olivier Rochus of Belgium 6-1, 6-0, 7-6 (4) and 2009 US Open champion Juan Martin del Potro, No. 18 Feliciano Lopez and No. 30 Kevin Anderson also advanced. Qualifier Lukas Lacko of Slovakia beat American Donald Young 6-3, 6-1, 3-6, 6-3 to earn a match against Nadal. Another American, 16th-seeded John Isner, won a 4-hour, 41-minute marathon, including a 99-minute last set, over former Wimbledon finalist David Nalbandian. Isner had 43 aces in his 4-6, 6-3, 2-6, 7-6 (5), 10-8 win. Nalbandian had several run-ins with the chair umpire during the often tense match. The Argentinian was enraged when a tournament official refused to overrule the chair umpire's decision to decline a review of a line call late in the fifth. He later smashed his racket to the ground in disgust when he netted a backhand on match point. Ivo Karlovic of Croatia beat Carlos Berlocq of 7-6 (4), 3-6, 6-3, 6-4 and will play Federer in the third round, while 13th-seeded Alexandr Dolgopolov of Ukraine defeated Tobias Kamke of Germany 4-6, 6-1, 6-1, 3-6, 8-6. Australian teenager Bernard Tomic beat another American Sam Querrey in the first night match on Rod Laver Arena, 3-6, 6-3, 7-6 (3), 6-3. Tomic will play Dolgopolov in the third round. Nadal figures he's in strong shape to add a second Australian Open title to the one he captured in 2009, one of his 10 Grand Slam singles titles.